In 1954, Ben Hogan stated in the serialized lessons he wrote for Life magazine that he had "a secret." He challenged the world to find it by stating "It is easy to see if I tell you where to look." He then wrote his legendary instructional book, Five Lessons, and created a remarkable golf swing puzzle, but somehow one important piece of information was missing. Golf expert after golf expert have attempted to define this secret over the years, serving to compile a rather lengthy list of what they think the secret is but never quite explaining how it's done. 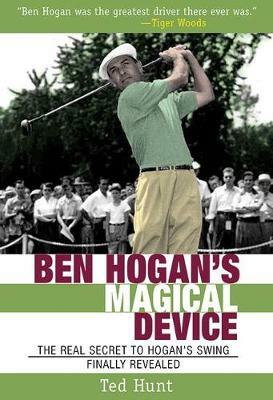 Enter Ben Hogan's Magical Device, a revealing book which intends to finally explain, in universally understandable terms, that long-lost secret to Hogan's swing. As a lifelong golfer with 50+ years of experience, two degrees in Physical Education and a Doctorate in History, author Ted Hunt became determined to track down Hogan's secret himself. He reviewed most of the literature concerning Hogan and interviewed many professionals (including Jack Nicklaus) and the result of his research produced a clearer understanding of the source of the confusion concerning Hogan's secret. An hypothesis was conceived and tested, and Hunt was pleased to discover that his analysis stood up to critical examination. But perhaps more importantly, his golf responded with more accuracy and lower scores, which included shooting his age (79) several times within weeks of embracing the secret. Complete with 100 photos, Ben Hogan's Magical Device gives an easy-to-follow explanation of Hogan's secret, where it comes from, and the foundations which support its successful execution. Interspersed throughout the text are stories from professional acquaintances who spoke with Hunt about their times with Mr. Hogan.